If you read my last post about art slumps, you already know that this piece gave me a lot of grief. Part of the reason was that the colours insisted on caking up. Even the royal blue that comes out pretty transparent. On any kind of paper and with any kind of brush, I found I could not give the background the lightness it needed to have. Then, on Monday, I found the solution to all my problems. Now this, my dear friends, is an English Wash Brush. (Don’t say this with your mouth full.) The hairs (Russian squirrel) are so incredibly soft that you almost don’t feel them. It cost a fortune (thanks, mum, for helping me out there, you saved my life!) but it’s another of those cases where quality does come at a price, and is worth every cent. 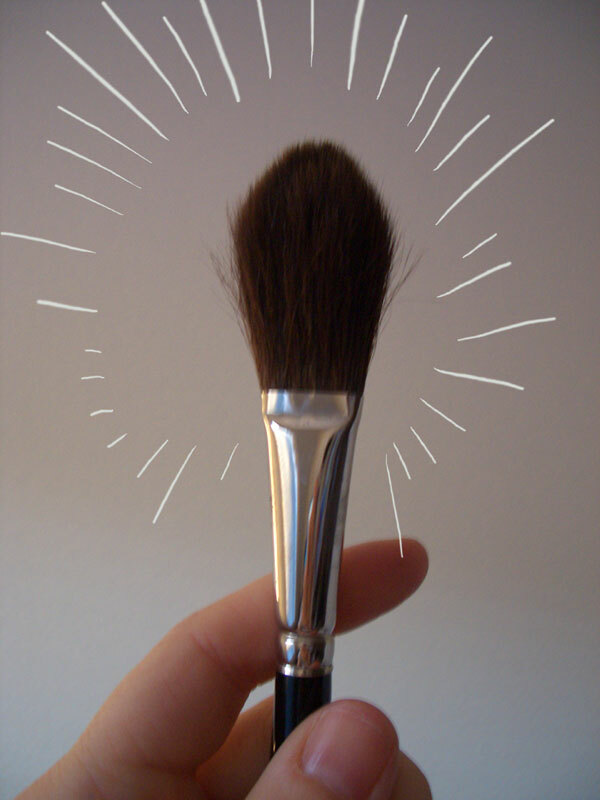 Why this one is better than a synthetic brush? Even a sable brush? 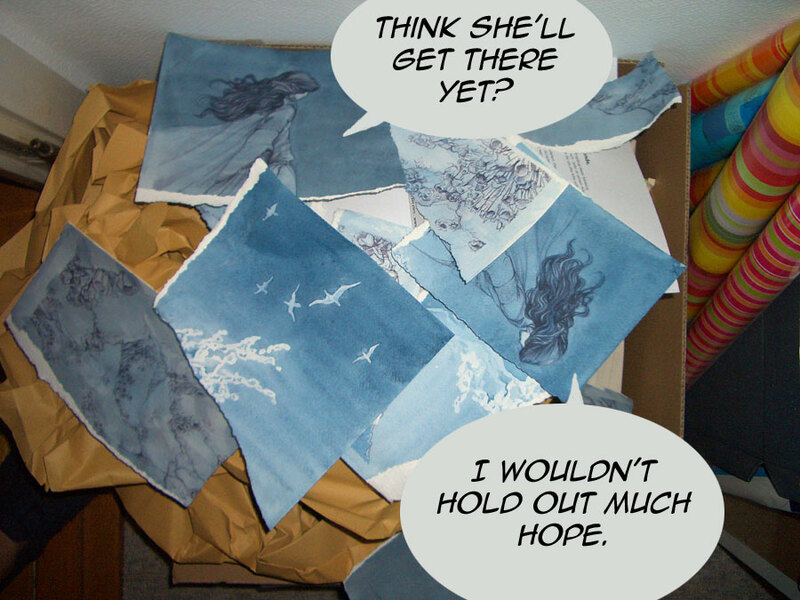 I wouldn’t have believed it, but this soft miracle adds a wash of paint while leaving the paper completely intact. Now when you paint, there’s always some amount of friction of brush on paper, resulting in a roughening of the paper. Rougher paper results in a caked look. The more water, the more layers, the poorer the paper quality, and the harder your brush, the more your paper will cake up and lose transparency. First, I put my new brush to good use and went about painting the same background a seventh time. I used a light Royal Blue wash with a touch of Cobalt and Indigo, dabbing off the paint with tissue while it was still wet where the crest of the wave would go. My goal was to give the entire image a blue, cool, otherworldly tint. 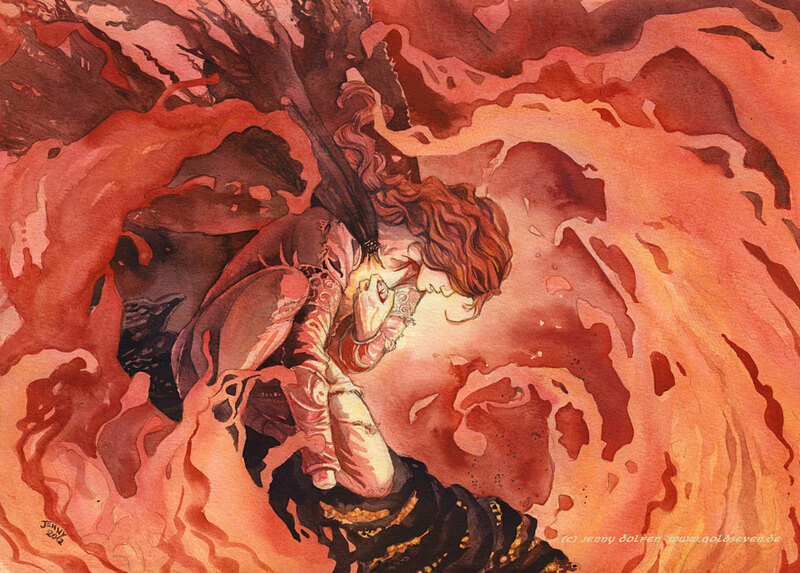 This piece is a sort of companion piece to “It ends in flame“, so where the other one is fiery red, this one will be cool blue. 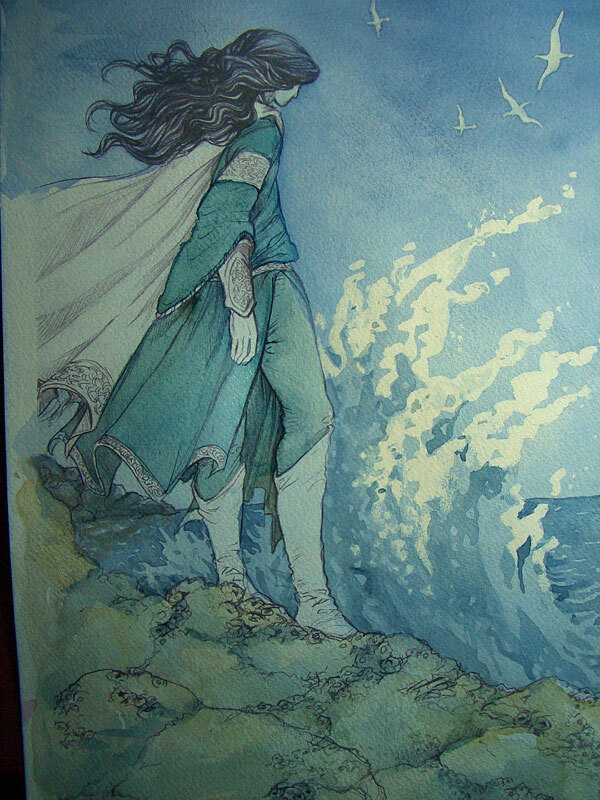 I then used some masking fluid to preserve the whites of the gulls and the crest of the wave. 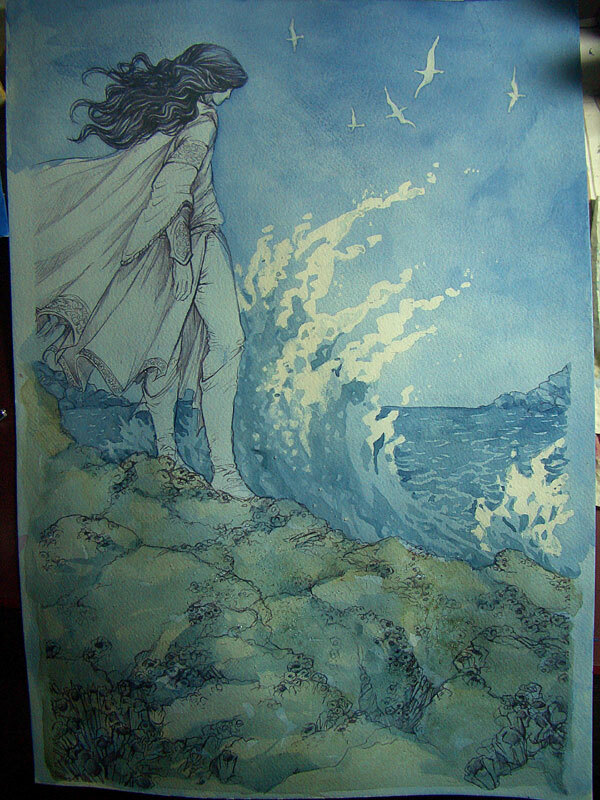 You may remember my previous trouble with masking fluid; I’ve avoided that by mixing the fluid with water. This way, it usually comes off fine. 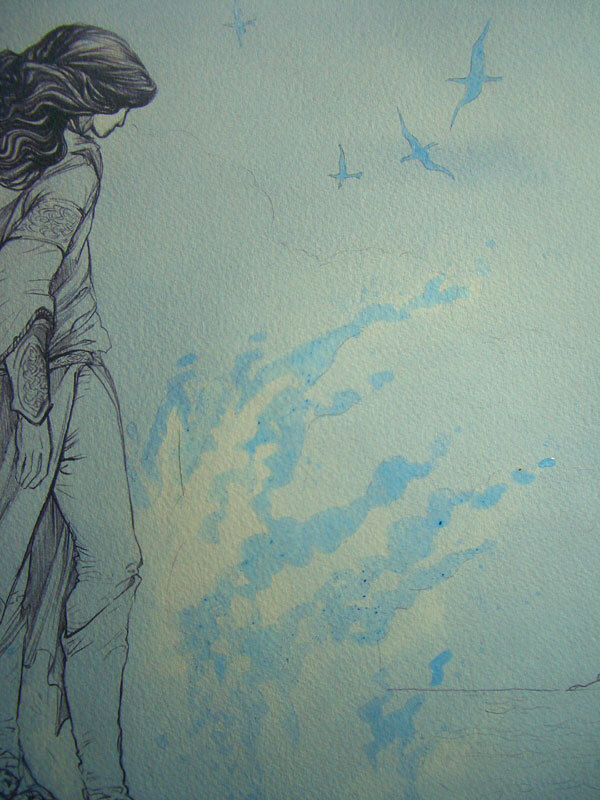 The masking fluid I now have is tinted blue. Very convenient, as the clear/white fluid is often really hard to see. I wait for the fluid to try – this takes about half an hour – and paint the darker portions of the sky. 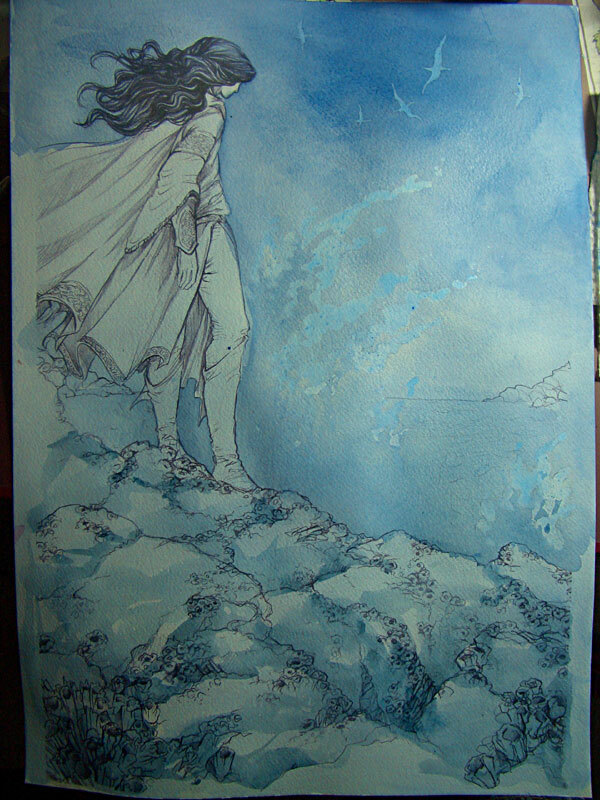 The wash I use for the darker sky portions is made up by Indigo and Royal Blue. 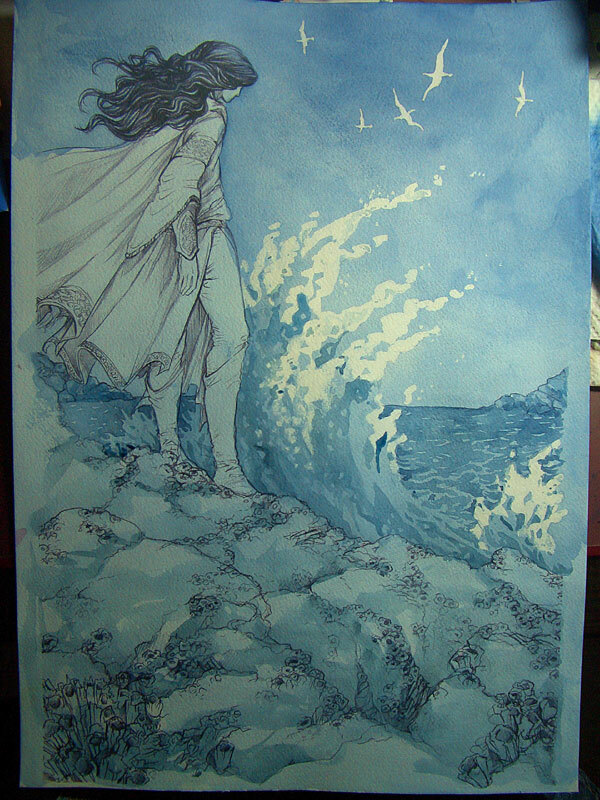 To set off the sea later, I’ll use more Cobalt and Royal Blue and less Indigo. My first attempts at this were rather monochromatic but they didn’t cut the mustard. They can still be found in the bin. I dab off paint again for the clouds. 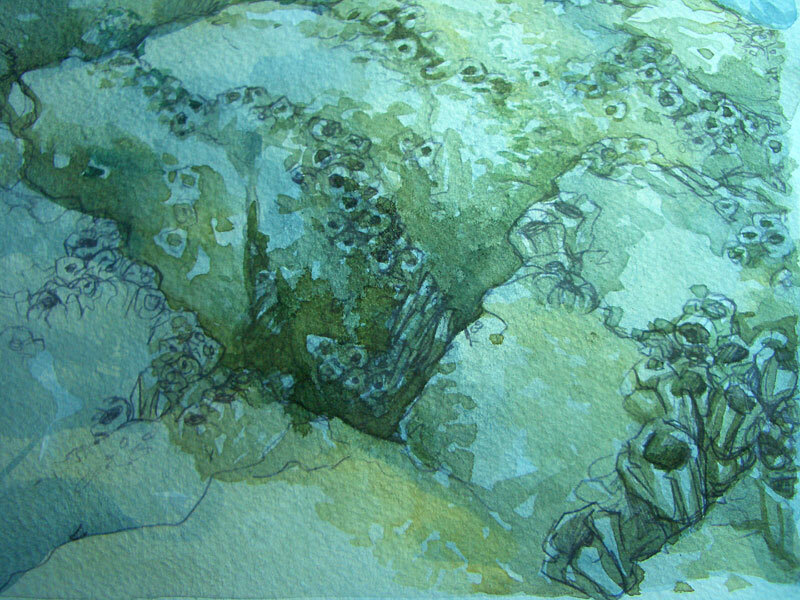 While I wait for the sky to dry so I can rub the masking fluid off, I paint the rocks with a bluish wash as well. That way, the rocks will later fit into the overall blue colour scheme though they will have some yellow in them. I use a large brush and paint mostly into the corners and edges that will be in shadow later. When everything is dry, I rub off the masking fluid. 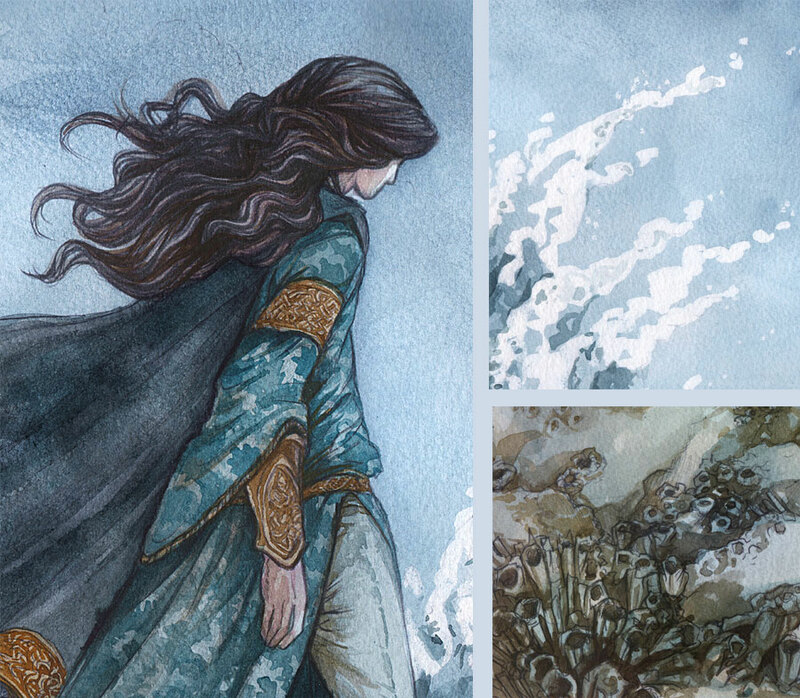 Next, I paint the sea. 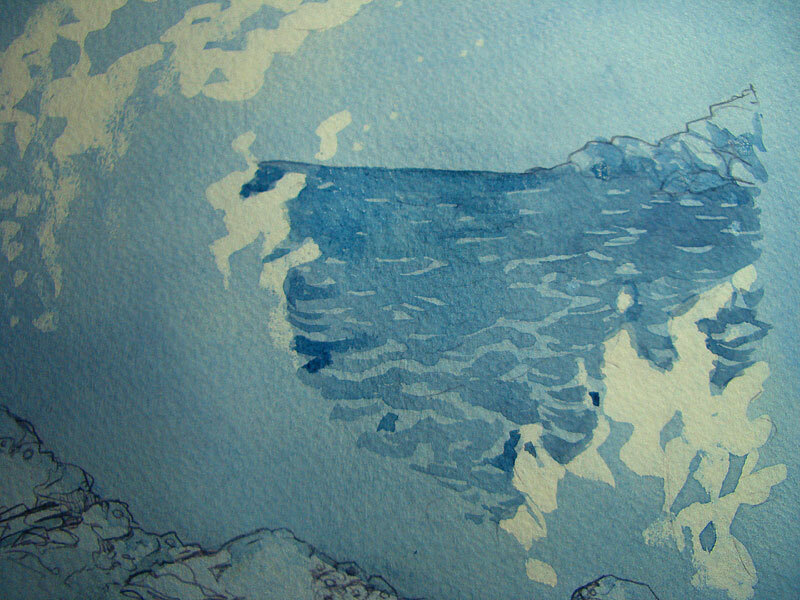 As stated above, I use Cobalt and Royal Blue, and paint around jagged bits that’ll create the illusion of waves. I make the smaller further back and bigger towards the front. 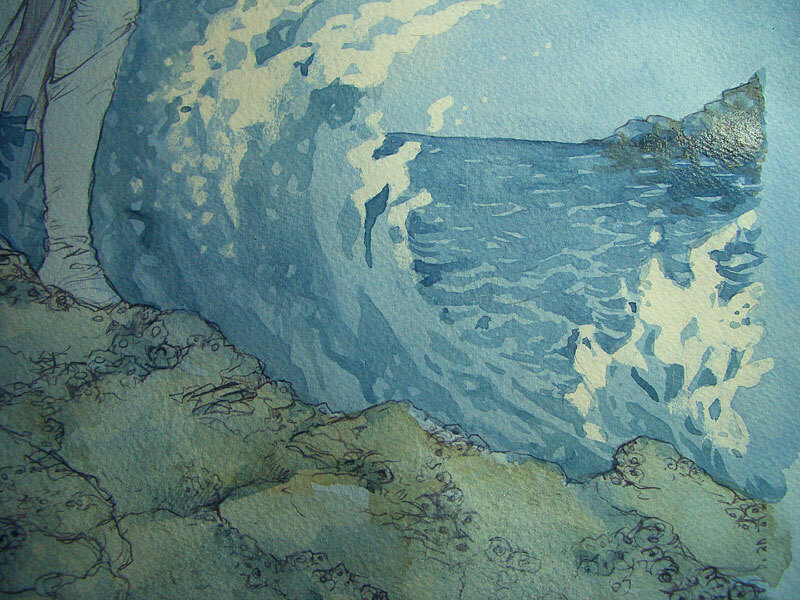 I then paint the insides of the rising waves with a darker blue containing Indigo and Cobalt. I use the same techniques as in my “Schimmelreiter” picture I painted two years ago, drawing up rising shapes of shadow and leaving lighter circles inside them to indicate foam. Now it’s time to add some more colour. I mix Yellow Ocre with rather a lot of all my blues as well as Sepia to tone it down, keeping the different drops of paint in separate portions of my palette so the wash turns out slightly different with every brush stroke. I use more yellow in the portions to the right of the rocks. I don’t do any detail work yet. 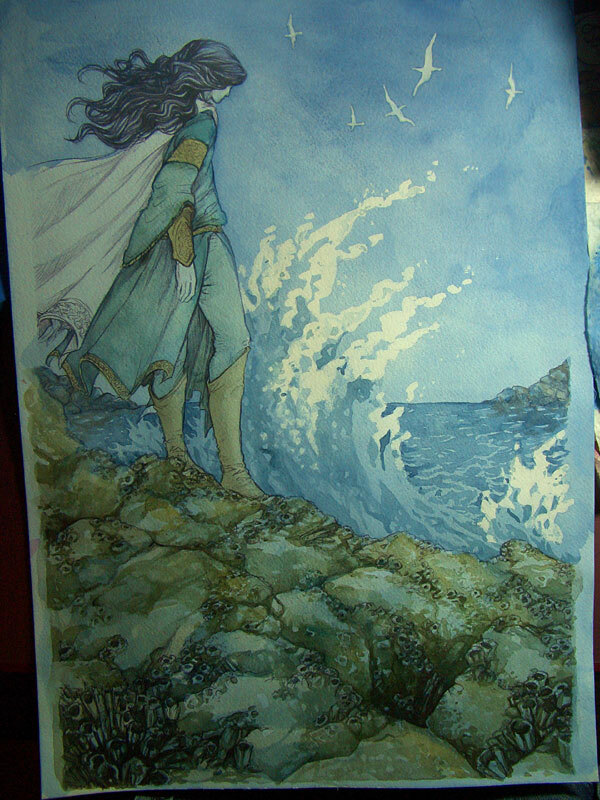 Of course, the rocks in the background get the same hue, only with more blue to indicate that they’re further away. 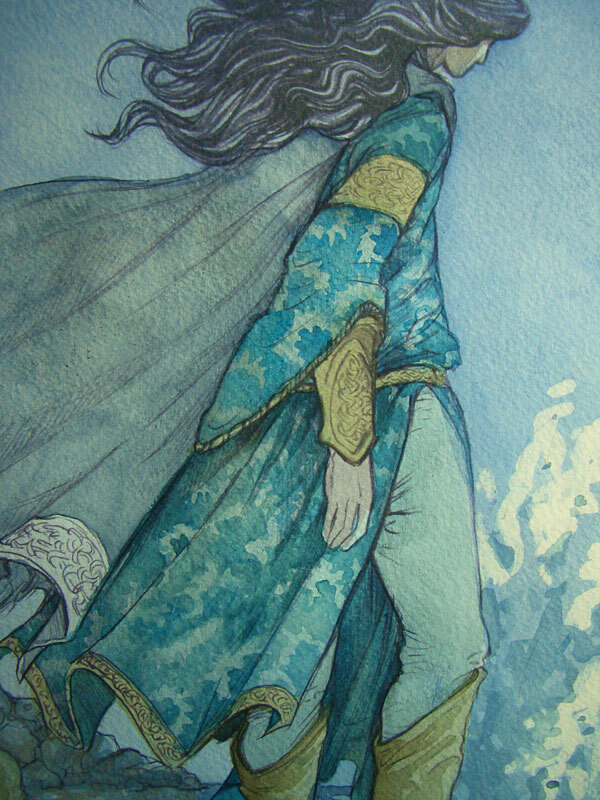 I then painted Maglor’s coat. 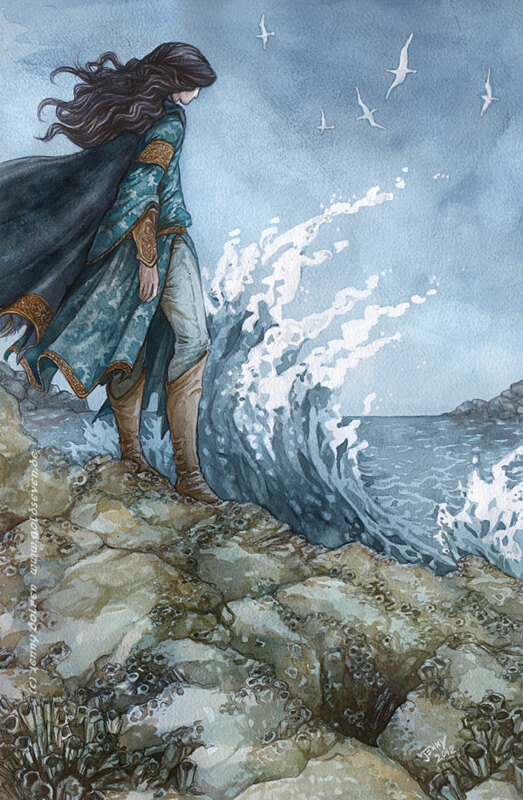 I stuck to the same basic hues I already had in the background, to make Maglor blend in with his surroundings and make him meld into them, as if he wasn’t really there any more and was becoming part of the seascape. 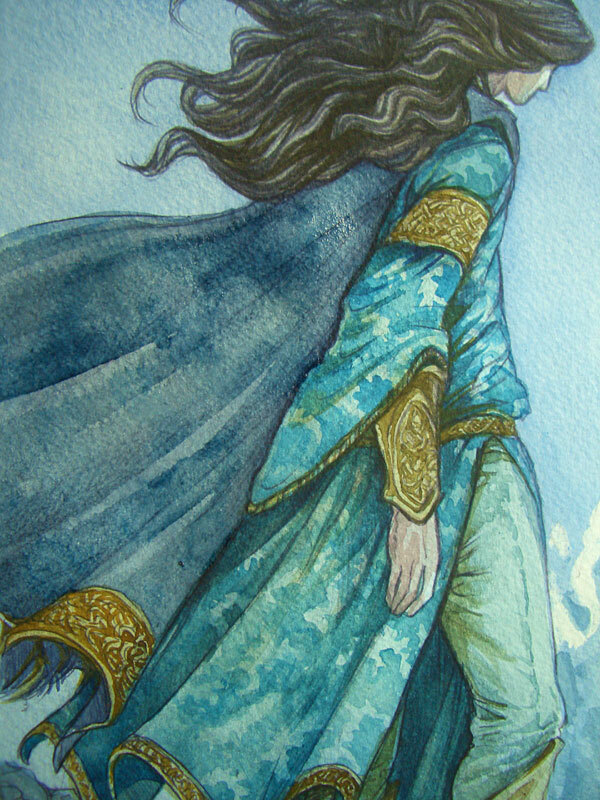 Here, I mixed Cobalt with a touch of Yellow Ochre to gave the coat a more greenish tint. For the ornaments and boots, I used pretty much the same tone as for the rocks. I left Maglor for the time being and turned to the rocks again. First because they’d dried by then and second, because in the past, I’ve frequently become caught up in one portion of the pic, rendering it to death before I really came to my senses and got a good look at the overall thing again. It worked for most of those pieces, but here, I needed a rougher, more dreamy feel. As I found out with all the ivy in “Ossiriand“, the only way to suggest detail is… to actually paint it. For this, I googled for barnacles to see how they were structured. In the lineart, I had already suggested barnacles in some portions of the rocks but not in others, to create lines through the pic and lead the viewer up to Maglor. 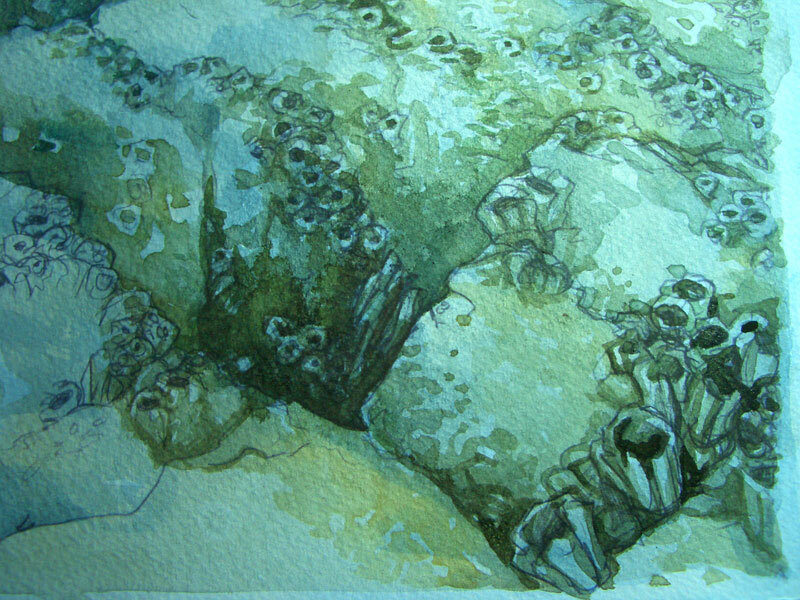 I painted the shadows around the barnacles darkest in those places. 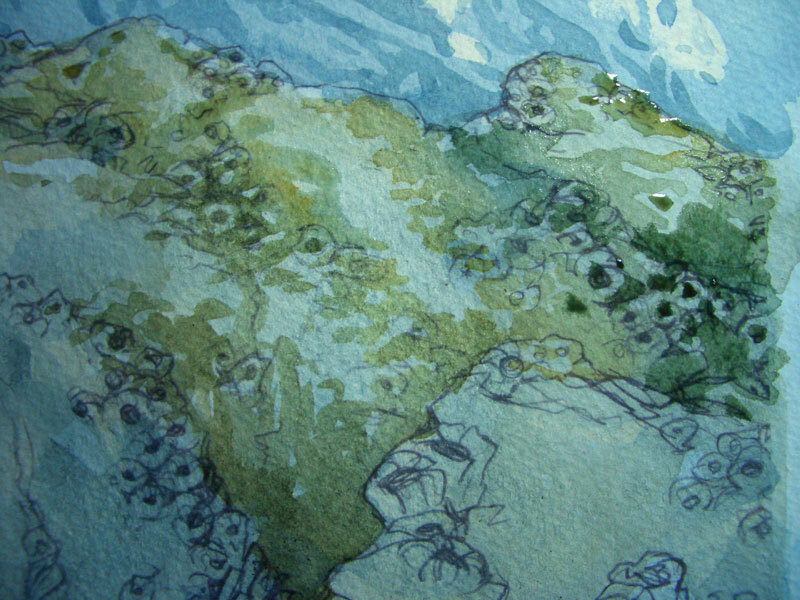 I gradually added three darker washes in the shadows, getting smaller and more detailed with each one, while leaving large portions of the rocks un-barnacled. Just some squiggly lines so they don’t look bland and smooth. I grew up on the North Sea, so for seascapes, I can always draw on a good amount of experience mixed with memories and emotion (and smell). I had the smell of barnacles in my nose all night. 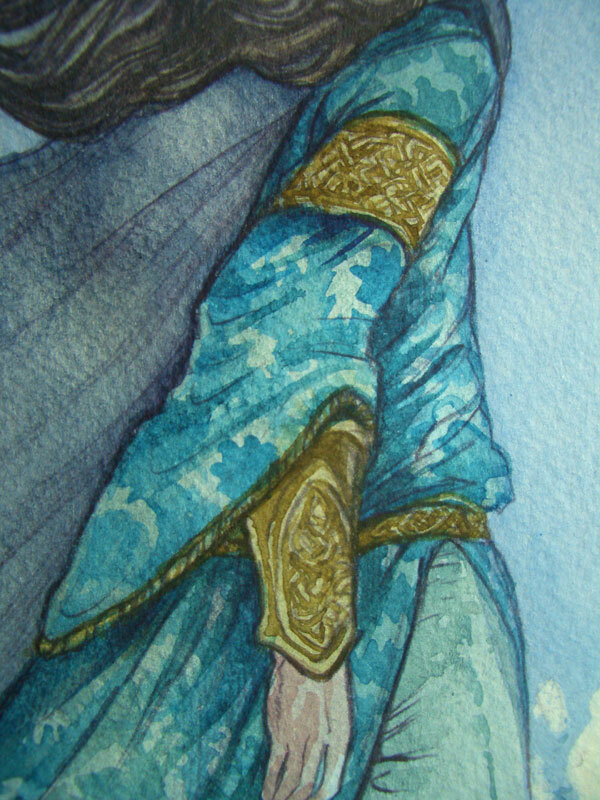 Some faded texture on Maglor’s coat. I wanted this double effect of clothing that looks at the same time richly ornamented and old and worn. Credit for the beautiful pattern on the coat goes to Marco Schüller and a painting he did of Columbus, who had a coat in the same pattern. I threatened that I’d send my Elven ninjas to steal the cloth from him. They’re as good as their word. Well, maybe not quite. His looked better. 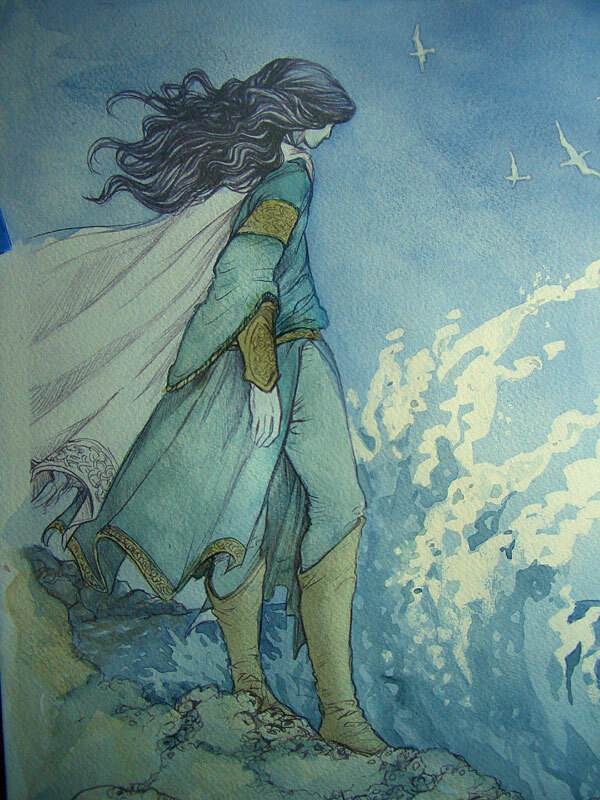 I then added shading to the ornamental borders on Maglor’s clothes, doing squiggly stuff again. Squiggly stuff is wonderfully versatile. It can suggest barnacles or knotwork depending on the amount, size, and shape of squiggling. The skin, by the way, was painted with a mix that doesn’t look like skin at all – Alizarin Crimson, Sepia, Cobalt Blue, and some Yellow Ochre. An actual “skin tone” would have looked horrendous here. 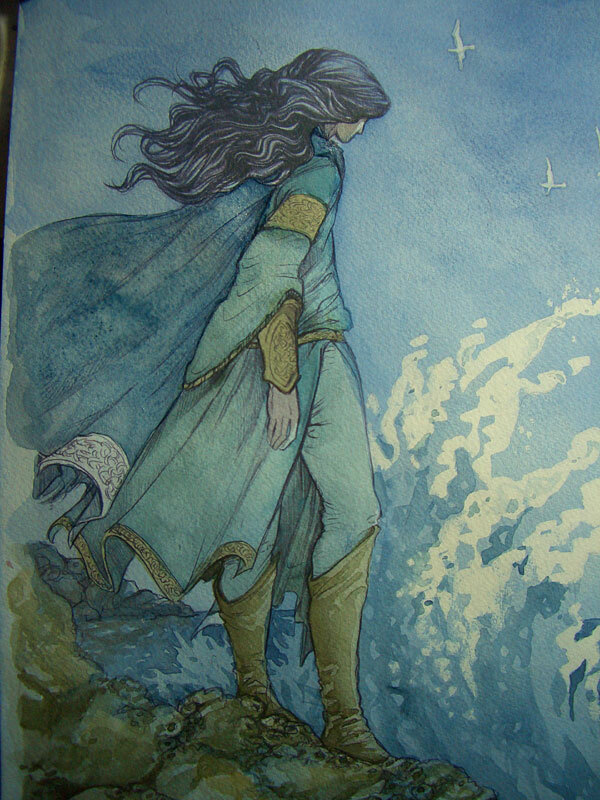 The hair was mostly done in Sepia, and needed next to no detail work, as most of that had been done in the lineart. 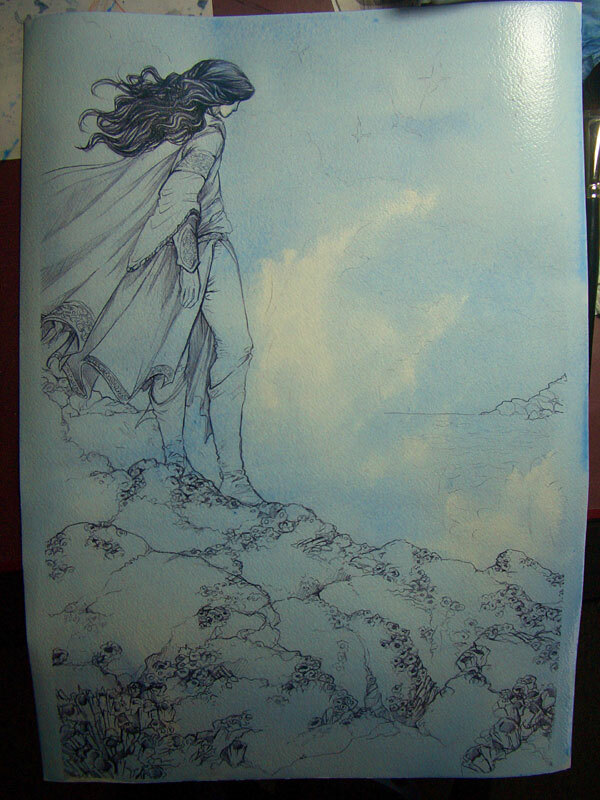 More darker Indigo for the cloak. And more vodka. Plus some detailing down the sides of Maglor’s legs to indicate a seam. The finished image, in its actual colours. ← Art Slump. Next stop: Drawing frenzy. That’s ver, very nice… I can almost smell the sea flavor, and listen to the seagulls, by looking at that. Thank you so much for documenting these steps. It’s a lovely painting. I wish I could do line-art like you do. Your tutorials always give me inspiration to get painting! Thanks. 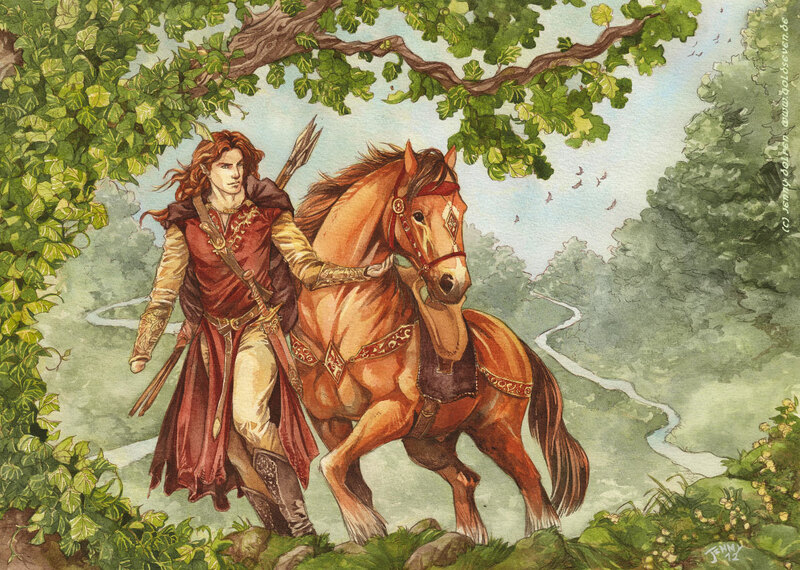 Love the final Maglor. Isn’t a new brush a wonderful thing? Can you tell me, where to get the amazing brush? Now it really gives the feeling the waves are making to him a tempting offer. You can almost feel them pulling. Great! Oh dear! Didn’t know that working on that artwork was driving you almost insane. Sadly I haven’t found the mentioned brush at any of the major art supply shops in Germany (like Gerstaecker or Boesner) – I think it’s Da Vinci series 803, it isn’t? Yes, that’s the one! And it’s even cheaper on amazon than at the store where I bought it. There were a few offers on mercateo where it was still a few Euros less. wow. amazing to watch. Captivating, really. Such beautiful work. omg, you make it look soooooooooooooooooooo easy! and you DO use masking goop! well, sometimes. you take it off a lot sooner than i would expect, too. 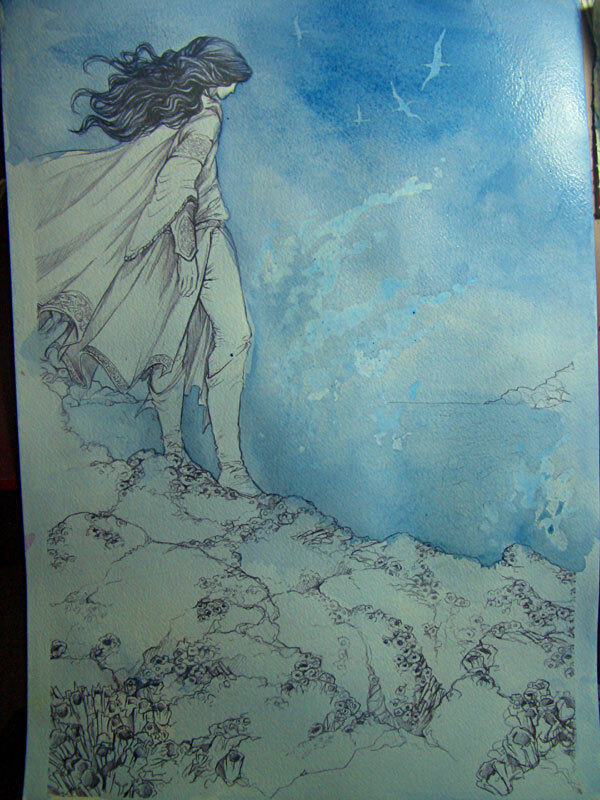 and ‘the only way to suggest details is to paint details.’ omg, i HATE that! lol!! you have the patience of a saint and true artist! This is so beautiful and heartwrending!!! Was so happy to see this. Well done!! !